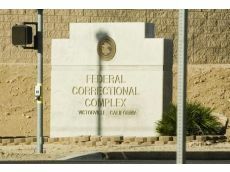 An inmate at the federal prison in Victorville was murdered Thursday after he was attacked by another inmate earlier that day, prison officials said in a press release. The name of the deceased is being withheld, but authorities did state the man was taken to a local hospital after the attack, which took place before 7 a.m. Thursday. He was pronounced dead a little before 9 a.m., according to the release. The attack took place in the Federal Correctional Institution 2, a medium security complex that houses about 1,700 inmates. It’s unclear what sparked the attack. The inmate who assaulted the victim was not identified as of Thursday afternoon. Prison officials are investigating the incident.